First and foremost I have to apologize for the poor quality of the pictures. My camera isn’t the best, I don’t have a scanner, and I didn’t want to damage my catalogs – they are rather fragile. M.U.S.C.L.E. was only in the Mattel catalog for two years. These catalogs tend to sell for approximately $50 each, but I have seen collectors bid auctions up much higher. These catalogs tend to be popular with Barbie collectors because it serves as a guide for Barbie fashions. Be patient and you might find one for much less. 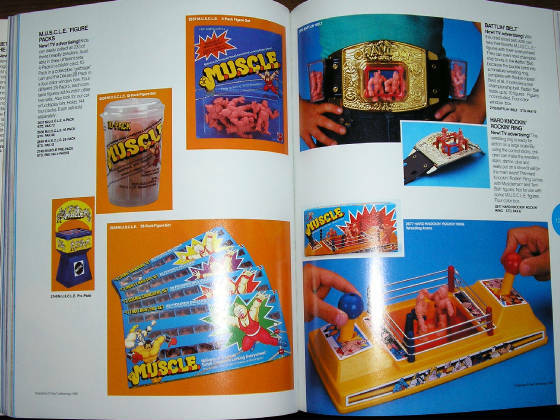 And be aware that M.U.S.C.L.E might have only appeared in the North American version of the catalog. I have not found a foreign Mattel catalog that has included M.U.S.C.L.E. 1986 was the launch year and it had four pages. In my opinion the first two pages are the most exciting because it allows the best view of all the different figures. You will instantly notice one major thing: M.U.S.C.L.E figures that are not on the poster. I believe that these figures are simply Japanese Kinnikuman used for the photograph. These Kinnikuman figures would have been readily available and identical to the “American” harder plastic M.U.S.C.L.E.s that were going to be released. Toy catalogs have often included items that were never released. 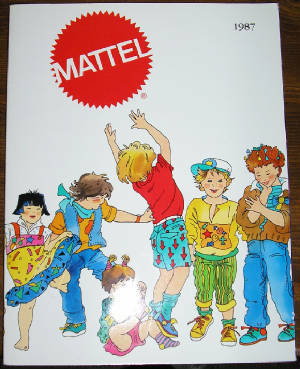 These pictures would have had to be ready for the catalog long before the toys would have to be ready for distribution. 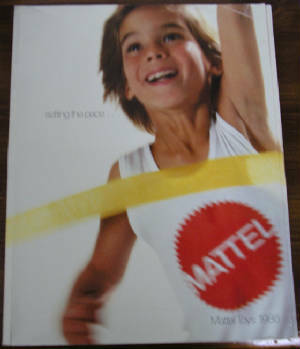 For a closer look at the “catalog figures” click on Mattel Catalog Figures. The next two pages showcased the actual products that customers could purchase. On the first page the 28-packs and 10-packs are rather boring, it’s nothing we haven’t seen. And while the 4-pack is the same as what we’ve always seen, there is a beautiful display piece for the 4-packs. It was called a MUSCLE Pre-Pack. It was designed to hold 144 4-packs inside of a wrestling ring type enclosure. I really like the art around it, and on the arch above the 4-packs. For a closer look at the MUSCLE Pre-Pack click on M.U.S.C.L.E. Pre-Pack. I also found it interesting that the catalog puts the official figure count at 233 figures. They also mention that the 28 packs include figures that were not available in the other two sets (4 and 10 packs). 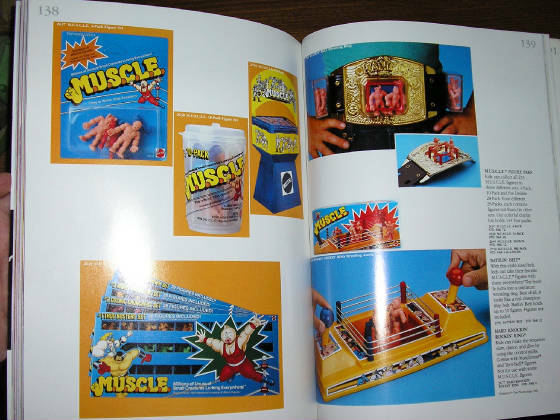 1987 was the final year for M.U.S.C.L.E in the Mattel catalog. 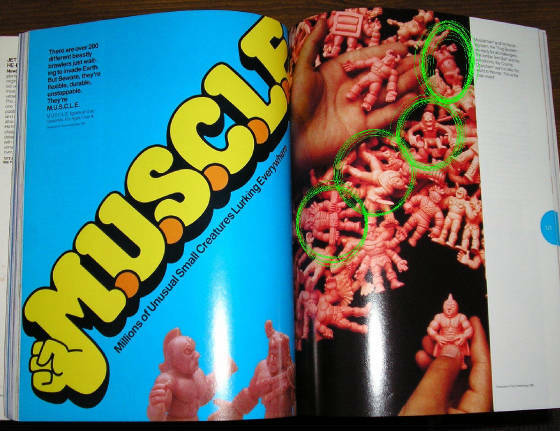 I thought the catalog made it clear that M.U.S.C.L.E. was not a top priority because this year they only received two pages. Plus there wasn’t really the introduction of any new product. The introduction of colored figures could really be viewed as simply a variant of the original figures.